The Star Wars Force Friday 2017 is here! Visit participating retailers such as Target, Toys R Us, and Gamestop and use the Find The Force feature in the Star Wars app during the Force Friday II Weekend. You can also find augmented reality-enabled “Find the Force” graphics online at starwars.com/findtheforce. 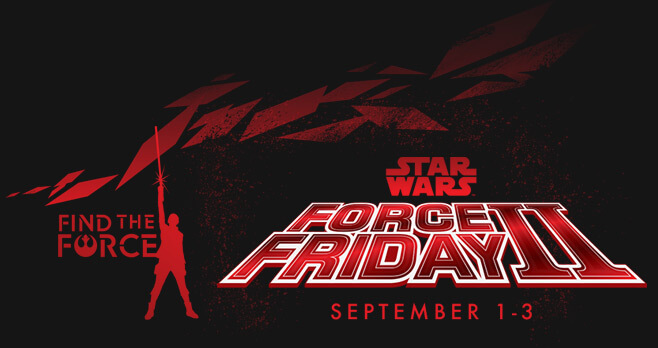 Share a photo on Twitter or Instagram using the hashtags #FindTheForce and #Sweepstakes and be automatically entered into the Star Wars Force Friday Sweepstakes. You could win the ultimate Star Wars fan experience – a trip to the Star Wars: The Last Jedi World Premiere in Los Angeles as well as a private tour of Lucasfilm in San Francisco. The Star Wars Force Friday II Sweepstakes is open only to legal residents of the 50 United States and the District of Columbia, Canada (excluding Quebec), Australia, the United Kingdom, the Republic of Ireland, France, South Korea, and Chile, who are at least 18 years of age or the age of majority in their country, province, or state of residence, whichever is older. The Sweepstakes begins on Thursday, August 31, 2017 at 7:00 a.m. PT/3:00 p.m. BST and ends on Monday, September 4, 2017 at 2:59 a.m. PT/10:59 a.m. BST. Download the free Star Wars app on a compatible mobile device and launch the “Find The Force” feature. Visit a participating store location* during the Promotion Period and locate an augmented reality-enabled “Find the Force” graphic. Launch the Star Wars app on your mobile device, click the “Find The Force” icon in the Star Wars app to activate the Find the Force feature, scan the augmented reality-enabled graphic using the Find The Force feature in the Star Wars app, and take a photo or video of any single augmented reality character that is available inside the Star Wars app. Post the photo or video of the augmented reality character on your Instagram account AND/OR tweet the photo or video on your Twitter feed during the Promotion Period. When posting or tweeting photo or video you must include both of the hashtags #FindTheForce and #Sweepstakes. Alternatively, you may visit www.starwars.com/findtheforce or another participating website during the Promotion Period and locate an augmented reality-enabled “Find the Force” graphic. Launch the Star Wars app on your mobile device, click the “Find The Force” icon in the Star Wars app to activate the Find the Force feature, scan an augmented reality-enabled graphic using the Find The Force feature in the Star Wars app, and take a photo or video of any single augmented reality character. Grand Prize (1 winner): A 4-day/3-night trip for winner and three guests to Los Angeles, California USA to attend the global premiere of Star Wars: The Last Jedi and to San Francisco, California USA to attend a tour of the Lucasfilm offices. ARV of the Grand Prize is $4,500. Second Prize (50 Winners): A Star Wars Prize Pack (including toys, books, and/or stationary). ARV of each Second Prize is $330. For the list of winners (first name and first initial of last name, as well as county and country) send an e-mail that includes the subject line: The Star Wars Force Friday II Sweepstakes Winners, to winnerslist@leaddogmarketing.com, for receipt no later than October 31, 2017 at 8:59 p.m. PT/November 1, 2017 at 4:59 a.m. BST.